Frank J. Cavaioli. Farmingdale State College, A History. Albany: SUNY Press, 2012. Pp. 316. ISBN: 9781438443676. Cloth, $29.95. Electronic, $29.95. Before discussing this comprehensive history of what is now Farmingdale State College, I offer two general comments. One is that every college and university deserves to have a history – one that recounts the tale of growth and development, written to satisfy the curiosity and interests of the on-campus world and also to inform that less partisan audience that has an interest in the history of higher education and in the way each and every particular campus’ tale can be set into a larger context. My other comment or reflection is that the tale of SUNY Farmingdale, told here in appropriate fashion to mark its centennial year, is very much a case study in keeping with the contours of Long Island history and growth since 1912 – from agricultural to suburban to semi-industrialized and fully developed. 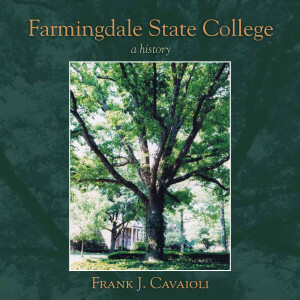 Frank Cavaioli’s long service at and detailed knowledge of Farmingdale make him well suited to tell its story, taking us from its humble and exiguous origins before World War I through the growth and full academic maturity that has been won in recent decades. By the early 20th century, there was a growing interest in agricultural training and the school, originally designed to accommodate upper-level high school students so they could deal with new “scientific” methods in what was still primarily an agricultural economy, was launched. Establishing the State Institute of Applied Agriculture was not without its problems. Opposition from the up-state “aggie” schools – there being no coordination of the public system until SUNY was established in 1948 – had to be overcome. But the obstacles were cleared, the land was purchased (on the present site), a director was appointed, faculty were hired, and (a few) students came to learn the new sets of skills. The tale of Farmingdale’s history turns out to be an uneven one. Moving chronologically, Cavaioli tells his history in terms of presidential administrations, of the building of buildings, and of the growth in the student body (matching the growing population of Nassau and Suffolk counties). The early list of men at the top is a story of strong leaders who fought with fair success for resources and for recognition, sometimes even against the opposition of the governor (Al Smith) and talk of closing the place down. However, some of these strong leaders also sparked student and faculty protests because of a style of autocratic leadership, a focus on top-heavy publicity rather than on better academic standards, and at times, an anti-union and even an anti-faculty stance. That several directors (later presidents) stayed for so long seems almost a guarantee that, eventually, there would be a confrontation (with 10 difficult years for the first director, Albert Johnson, 23 for Halsey Knapp). This is not to argue against enlightened leadership, and much credit goes to such recent leaders as Charles Lafflin (1961-76) and Frank Cipriani (1978-2000). They recognized the need to shift from the original emphasis on agriculture to technology and career-oriented programs (such as aerospace technology and dental hygiene). They fought, with success, to become a four-year, BA/BS granting branch of SUNY. These struggles led to the institution that is now firmly in place and the future of Farmingdale seems as secure as that of any of the four-year colleges of the system: growing numbers, greater diversity of offerings, an awareness of how to move with the times. We can say that the College has successfully made the great transition, even if moments of nostalgia take us back to the days of cows in the barn and ice cream made on campus. The Farmingdale archives are rich and very generous, yielding the many photographs Cavaioli has included: prominent figures, buildings, ceremonies, teams. One point that stands out: despite a co-ed student body from the start, in a number of faculty and college-community pictures (1947, 1970, 1993, 2008) not a woman is to be seen. This, of course, is not a criticism of this book, but of a male-oriented power structure, now heavily eroded. One criticism of the author: much of the hard data is buried in the narrative, making it difficult to trace important aspects of growth and change. Tables would have helped the reader chart the school’s many names, the development of new majors and fields of concentration over the years, and such vital numbers as enrollments and faculty (numbers that could have been presented in one form for the entire century). Maps of the campus would amplify the story of expansion and also that of the real efforts to build and maintain tradition – preservation of original buildings and even some of the oldest trees. But as Cavaioli set his task, he has certainly succeeded in offering a college history that will please the alumni and inform the larger public on one chapter in the larger tale of public higher education.